Ana translating during a diesel to veggie oil conversion workshop. As the only team members from Brazil, Ana Bonomi and I supported the team by driving and translating. Even though it was very demanding, it was also a great opportunity to bond with both our team members and local partners. Driving was fun! After three years of riding bikes in Cambridge, it was awesome to try again the fight-for-your-space-on-the-road traffic in Brazil. I missed this driving style. But as I am not familiar with São Paulo, I got lost many times. On our way back from Cruma on workshop day one, I lost sight of Ana Bonomi’s car in great style, as I forgot our cell phone and had no idea where we were. Sara, Sam, Hossam and I went for an involuntary hour-and-a-half tour throughout São Paulo until we finally found Ana Bonomi’s house. I am glad the team was very patient, kind, and we made fun of the situation. Thankfully, Hossam got us a map on the second day, which prevented us from getting lost again on this gigantic city. According to Instituto Brasileiro de Geografia e Estatística (IBGE), Brazil’s census institute, twenty-two million is the total population of the official metropolitan area of Sao Paulo, spread throughout 3,067.2 square miles. A view of Sao Paulo. Brazil is home for post author Ana Luisa Santos. Photo from Wikimedia Commons. 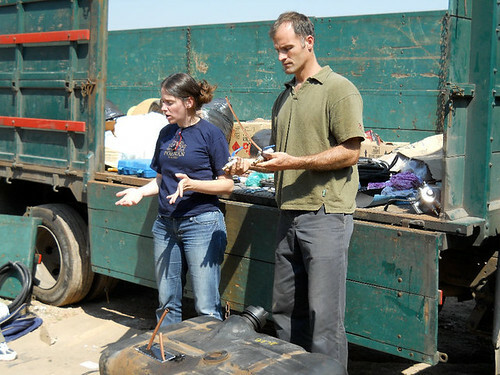 The team made a great effort to communicate with our partner catadores, or waste-pickers. We also split tasks well to optimize the communication and all kept a great attitude when translators were busy. Sara and Sam had a good advantage of speaking Spanish. Libby’s Portuguese was getting better and better. Ângela and Hossam seemed to understand more and more each day. Our mechanic-fix-it-all partner Patrick Keaney impressed all of us by introducing snippets of Portuguese to his English sentences during the workshop. He kept reading his Portuguese book and asking for vocabulary on our way to the Coop. At times it was quite funny. While building an improvised mechanical part, he repeated a popular saying in Portuguese: “Quem nao tem cao, caca com gato,” meaning “if you don’t have a dog, you can hunt with a cat”. Soon catadores started calling him “McGyver”, the 90’s TV show fix-it-all icon. After day two, some catadores could communicate with Patrick with gestures or intuition of what needed to get done. It was amazing to witness catadores’ commitment and interest despite the language barrier. My voice was gone after five days, but it was very rewarding to help the team communicate with our local partners. Ana Luisa Santos completed a Masters Degree at the MIT Media Laboratory in 2009. She is now back to her beloved Brazil to start her first company.